Experience first-hand the Japanese culture while your live and study with a Japanese host family and attend the local high school. Ayusa Study Abroad students who choose to study in Japan are placed with carefully selected host families throughout the country. Placement areas in the past have included Kanagawa, Chiba, Saitama, Tochigi, Gifu, Osaka, Kyushu and Okinawa areas. The family is the foundation of Japanese society and is bound together by a strong sense of reputation, obligation, and responsibility. Adjustment to host family life and Japanese culture will be assisted by a local representative. Fall Semester, Spring Semester students arrive in Japan for an orientation which includes an overnight stay in Tokyo. Each year Japanese schools hold an optional event such as a school festival, athletic event, or school trip for seniors. Additional costs may apply if you choose to participate. Fall Semester students attend school September through January while Spring Semester students attend school April through June. There is a designated teacher in charge of all exchange students at each school. He or she places each student in a homeroom class and decides which subjects each student will take. In general, Japanese high schools do not offer many electives; students generally choose only between fine art, music, or calligraphy. Students stay in the same classroom all day and the teachers move from room to room. This allows exchange students to integrate quickly into the class community. The average class consists of about 40 students. Japanese high schools have three grade levels and placement is determined based on academic performance and Japanese language skills. The Japanese school system is more rigorous than its U.S. or Canadian counterparts. Students may also find that school policies are more strict. Students are required to wear a uniform and there are rules that dictate what is acceptable in terms of appearance regarding: hairstyle, shoes, socks, length of skirt, and use of make-up or accessories. 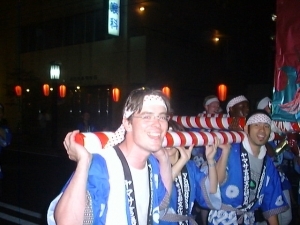 To ensure that students have the language skills necessary to successfully integrate into their host community, students interested in participating on a Fall, Spring, Academic Year program in Japan must have formally studied Japanese for at least 2 years and be able to pass our language exam. The more Japanese you know the faster you will be able to adjust to host family and school life. To ease your adjustment, it's important to try speaking Japanese as much as possible with your host family, friends and teachers. The family is the foundation of Japanese society and is bound together by a strong sense of reputation, obligation, and responsibility. Integration into a Japanese host family means having a completely new daily routine, starting from how you greet your host family, to bathing differently than you are used to, and learning to live in a small space with other people. It will be a personal enrichment to live in a society where politeness and a respect for community and harmony are very important. School plays a major role in the social life for many students in Japan. One reason is that school is the main meeting point for Japanese teenagers and their friends. Parties or visits at the home are rare because living space is too small to accommodate social activities. In addition, Japanese students are very active in sports, music and other school-related clubs. These activities usually take place for one to two hours after school and on Saturday afternoons. Japanese students are very committed and disciplined in their chosen extracurricular activity and tend to belong to only one club at a time. Sports and cultural activities offered vary from school to school. Baseball, the most popular sport, tends to be highly competitive at all levels. Many people throughout Japan follow the annual high school baseball championships. Other common sports include soccer, volleyball, tennis and kendo, a martial art. Popular cultural activities include flower arranging and calligraphy. In Japan, a mix of Western and Japanese influences can be found in both spectator sports and the arts. While baseball is practically a national pastime, many people also enjoy watching sumo wrestling, judo, kendo, and karate. Western performance arts such as symphonies and ballets are common, but many Japanese are also interested in traditional arts such as bunraku (puppet theater) and the highly stylized dramas of noh and kabuki. Karaoke and going to the movies are also very popular activities. This program is not advised for those students who have strict diets. While the Japanese eat a lot of fresh vegetables and fish, vegetarian diets are rare.